As a leading provider of laboratory anaylsis services and aviation maintenance products, Aviation Laboratories is always looking for quality dedicated people to join our team as our company grows. We’re seeking qualified candidates for our Regional Sales and Customer Service Representative openings. We take pride in being an employer of choice among aviation professionals by offering competitive salaries and comprehensive benefit plans. 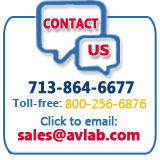 Interested candidates should submit resumes to sales@avlab.com and someone will contact you should your resume be considered.